A lot of runners agreed that the Salomon Sense Ride worked well on hiking, running and walking activities. Many testers commented that the Salomon Sense Ride has many color options from which to choose. The shoe had an affordable price, according to most of those who have tried it. Some users noted that the outsole provided enough traction for short and long-distance running sessions. According to some consumers, the upper area dried quickly. A good number of buyers said that the shoe was breathable and comfortable. A lot of reviewers agreed that the Salomon Sense Ride was durable and lightweight. Some users commented that the dense toe bumper was protective. Many buyers loved the visually-appealing design of this running shoe. One of the reviewers commented that the Salomon Sense Ride did not work well on extremely rocky terrains. Many runners loved the Salomon Sense Ride. They agreed that it was lightweight, durable, breathable and comfortable. They commented that the shoe worked reasonably well on any hiking, walking and running activities. Some runners said that it was not best for rocky terrains but others still recommended the Salomon Sense Ride because of the right amount of traction it provided for long and short-distance running sessions. 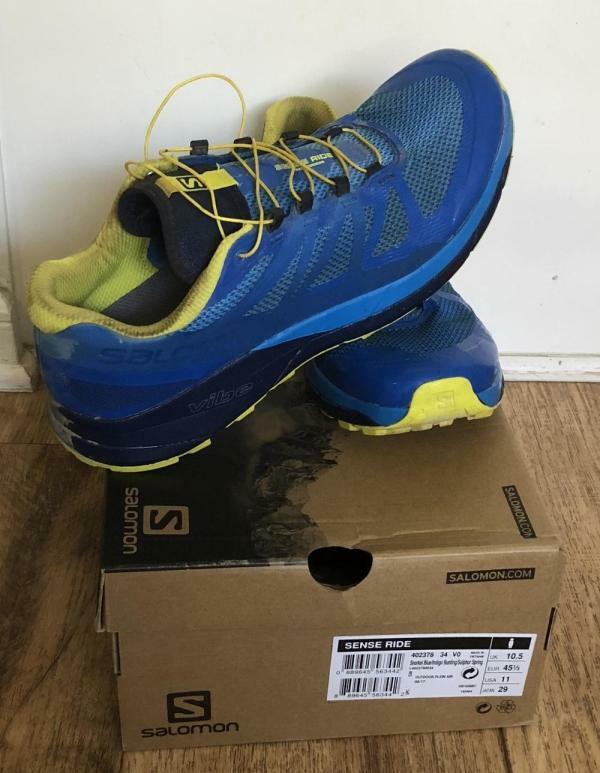 I have been running in Salomons for a number of years now having tried everything from the X-Missions to the S-Lab series. Admittedly one of my favorite shoes from Salomon has been the original Sense Pro. However when the Sense Ride was released and marketed as a “quiver-killer” with S-Lab technology at a much more affordable price… I knew I had to give them a shot. Right when I slipped this shoe on my foot, I was already enjoying the feel. I have a narrow foot and have always liked Salomon for their Endo-Fit technology that allows for a good snug fit. I had read some reviews saying that compared to other Salomon shoe models, this shoe is much wider. However, this shoe fits perfectly through the midfoot and has a slightly wider toe box, which I actually prefer. I believe that someone with a wider foot would also find this shoe to be very inviting. The Sense Ride was so comfortable that I actually took them for a 50k training run right out of the box. It did take me a few times of having to stop and re-adjust the laces before I got them right (possibly due to the wider toe box than I am used to in Salomon). I am happy to report though that I had no problems relating to the shoe on that run, and once I got the lacing down they have given me no problems during other runs. 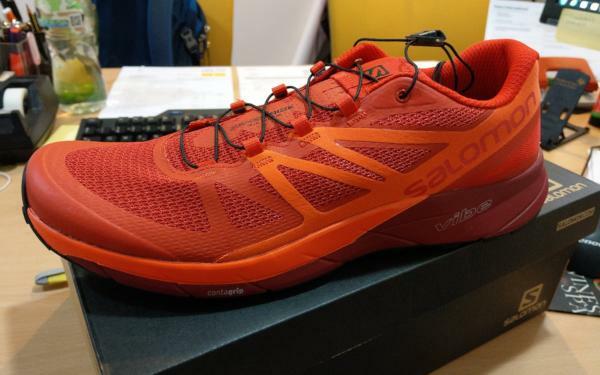 Salomon uses their Vibe midsole in this shoe that is actually a technology from their road shoes. The midsole is supposed to help in reducing vibrations while running yet still give a firm ride. To be honest, I am not sure I noticed a whole lot of difference with this shoes compared to other ones I run in, which was my favorite part of this shoe. I am personally not a fan of more cushioned shoes and prefer a firmer ride where I can feel the ground (especially on trails). I have run in highly cushioned shoes and am not a fan of the feeling that I am running on marshmallows. Salomon markets this as a high cushion shoe, but when I was running in it I was happy that I could still feel the ground underneath me. I do not think enough can be said about Salomon’s outsoles in general. They are by far the most durable outsoles I have run in and this shoe is no different. After over 100 miles showing hardly any use of wear. I have always loved the traction and durability of the Salomon outsole. The shoes are grippy enough that I am comfortable on technical terrain but will hold up fine if you need to do a few miles on the road here and there to get to or from a trailhead. One thing I will say is that where I live in California, I have not had much of a chance to put these shoes through any conditions such as mud or snow. So I am not sure how the traction is in more extreme type conditions. All in all, the Salomon Sense Ride is awesome. Any shoe I can take out of the box and run a 50k in without any real problems is a good shoe in my book. Is this shoe really a quiver killer? For me NO. I say this because, for myself, an 8mm drop is just too high to be my only shoe. The 6mm on the Sense Pro is pushing it for my liking. However, if you are someone who prefers a little higher drop and a shoe that provides good cushioning while still giving you a firmer ride, then I would definitely give this one a shot. Salomon has always been my trail running shoe of choice. After spending 2.5 hrs trying on every trail shoe available in the store, the Salomon Sense ride was the one I went for. It’s been just over a year that I have had these shoes, and at the rate, I could probably keep them going for another. 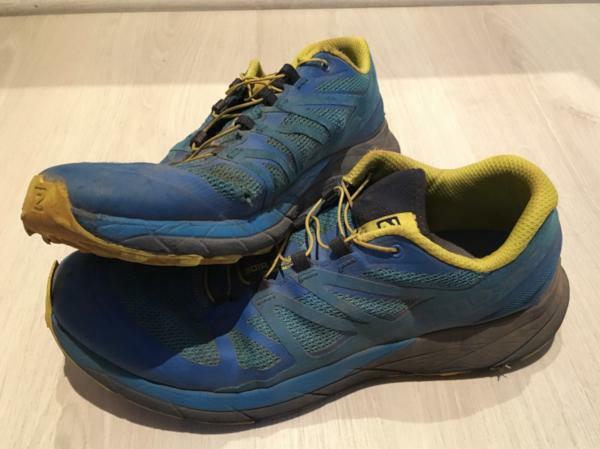 I used them for trail only as a training and race shoe. My name is Paul, and I run in marathon and Ultra-distance road and trails. But enough about me, this is their story. As you slide your foot into the Salomon Sense Ride, the first thing you notice is the wider toe box and midsole. As a neutral runner with a narrow foot, the extra width of the shoe offers more support for your foot without feeling like you are wearing snowshoes. I was surprised how my foot still felt secure in the shoe even with more room. My foot did not slide around inside the shoe, and I was not subjected to any hotspots or discomfort. The gusseted tongue is also a great feature that helps with the all-around secure fit, feel and comfort of the shoe as well as keeping dirt and debris out of the shoe along the trail. The Salomon quicklace system makes the shoe hug your foot and keeps them fitting snug throughout your run. I hate running with normal laces as it plays on my mind all the time. With the quicklace system, you know you are good to go from beginning to end — one pull to tighten the “arms” around your foot. Drop the buckle to secure the laces, tuck in the buckle and excess lace into the tongue pocket, and you’re all set. The cushioning is great. The heel is cushioned nicely, and the midsoles are cushioned enough for longer runs. You can still feel the earth beneath your foot and respond quickly to uneven and more technical terrain. I am not the lightest runner and so cushioning is important to me. Especially over the distances, I like to cover. The Salomon Sense Ride is very durable and lightweight. The toe bumper is light yet dense and has saved me on the trail a number of times. The breathability of the shoe is high, and your feet remain comfortable even on the longest runs. The grip on the outsole is awesome on wet and dry days. They give you the confidence to keep moving over all obstacles at your speed. The lugs on the outsoles on my shoes have worn down by half after a year and 515kms. Probably my favorite thing about the Salomon Sense Ride is how quickly it dries while running. A couple of races I ran in them had some serious river crossings where I was either knee deep or swimming in full gear. When you get out of the water, the shoe sloshes once or twice, and within 5 minutes your feet are back to feeling comfortable and dry, they do not hold water, and your foot stays firmly in position and does not slide around in the shoe. I suggest anyone who wears this shoe on training runs must give it a go and get them fully submerged in water where possible. Trust me; trust these shoes in any environment! The Salomon Sense Ride has been nothing but exceptional for me on the trails. With their good looks and awesome capabilities, this shoe is great for a beginner and an avid trail runner. The longest time I spent in this shoe was a 9hrs and 30min run over 42km’s and 2600m elevation. This included 4 river crossings, and I did not have one issue with my shoes or feet. I have known Salomon shoes for a while and got to use a few pairs in the past. The Salomon Sense Ride caught my attention since the moment it was released and also other reviews praised how good this shoe was. I had to give a try for myself to see if it could keep up to the expectations. This is the very first model to use Vibe technology (EVA foam) for the cushioning in the heel. It is equipped with the usual features such as Endofit, Sensifit, and Contagrip Sole. Regarding color, I chose the fury red that is really flashy. There are other colors like blue and black but more color options coming soon. Right out from the box the shoes look nice. Not too heavy I would say. To get a better feeling of what the shoe can achieve, I have put 300km and alternate with my other shoes. From packed trails, rocky sections and road too. Let's start talking from the inside out. I didn’t find the fit narrow at all, but maybe for those with a bit wider foot may prefer something with more room in the toe box. Endofit and Sensifit make sure your foot stays in place at all times, and no sign of blisters due to friction. Also, make sure to choose your socks wisely. I am not going to be too technical but more on the practical side. This shoe comes with an 8mm drop, and it is an excellent choice for a wide range of runners. It is neutral oriented, mostly for using at the trails but also suitable to mix with some road sections. As mentioned before, this shoe packs in the midsole Vibe technology that absorbs the vibration while running. It feels very comfortable either you go fast or at moderate pace. Salomon continues to excel in terms of grip. The sole has been excellent so far. You feel secure in every footstep, and I didn’t find myself in any dangerous situation while using them. The lugs provide good traction when needed, either you go uphill or downhill. Sharp rocks are not a problem either, but you can feel the terrain when it gets rough. It is good to have that feeling and also to know you have enough cushioning too. One more important feature that allows your feet to stay in place is the laces. It is equipped with the quick-lace system, giving you the right tension to secure the upper and keep the lace in the small pocket under the tongue. This system has proved to be a winner over the years since Salomon implemented in most of their shoes. As you can imagine, this shoe ranks very high with an excellent overall impression. Not because the design looks good, but it delivers its promises. I think this shoe packs lots of features at a competitive price. Most important is that it allows you to run in a variety of terrain with a good transition. For my personal experience, I wish to have extra ventilation in the upper but keeping the toe protection as it is. Especially if you tend to sweat much, the interior can get a bit squishy after being used for over 2 hours. My longest distance was around 22km, and they held well. I think they can be suitable up to marathon distance giving you enough comfort during your run. A very well round up shoe no doubt. I am sure you will have lots of fun while using them. The Sense Ride I've actually been really pleased with, comfortable with, and I trust. To me, that says a lot and goes a long way. The Salomon Sense Ride is a neutral trail running shoe that is intended for runners who do not excessively pronate. It features the Vibe technology that disperses shock vibrations before it reaches the foot. The Ortholite sock liner is a feature of the midsole that contributes to a more supportive and cushioned ride. The outsole utilizes the Contagrip technology, which provides traction on muddy paths, rocky trails, and other wet surfaces. Salomon’s Sensifit is essential for a snug fit. It uses the Quicklace system that securely holds the runner’s foot by keeping those laces out of their way during their activities. The Salomon Sense Ride follows the standard measurements when it comes to both width and length. This shoe is best for runners who prefer technical trail running activities. B - Medium is the available width for the women’s version while D - Medium is for the men’s version. Same as in the popular Salomon Sense Ride 2, the Salomon Sense Ride has a Premium Wet Traction Contagrip outsole. This feature provides non-slip traction for a variety of trail surfaces. Contagrip is a mixture of different compounds that have different densities. The zones of the outsole are harder or softer, depending on the areas where they are placed. Featured in the midsole is the EnergyCell+ which is a lightweight material. This foam provides energy return while delivering durability and cushioning. Vibe technology combines Opal and EnergyCell+ that work together to attenuate vibrations. This feature reduces muscle fatigue and potentially injurious load to the runner's body to ensure a responsive ride. A cushioning compound called Opal is inserted into the midsole. This material aims to provide a comfortable and soft underfoot ride. Opal is lightweight, durable and able to maintain its performance at different temperatures. The midsole has a Compressed EVA that provides anatomical support and underfoot cushioning. It features a ProFeel Film which supports the foot during the transition phase. It provides midfoot protection without compromising ground feel. The midsole features an OrthoLite sock liner. This foam has anti-bacterial components that promote a healthier, drier and fresher foot environment. It is combined with an EVA heel cup for added cushioning and heel support. The upper is composed of a 3D Stretch Air Mesh. It aims to provide maximum breathability and a customized fit. A Quicklace technology is featured in the upper area for easy adjustment of the fit. The lace is made up of Kevlar fibers that promote one-pull tightening. The Salomon Sense Ride utilizes the Lace Pocket which tucks laces to avoid disturbances while running. It uses the Sensifit which cradles the runner's foot from the lacing system to the midsole. This technology is significant in providing a snug and secure fit. The upper also utilizes the Endofit technology. This feature is an internal sleeve that is designed to hug the runner’s foot to heighten security and snugness.